How do drones and commercial aircraft avoid midair collisions? 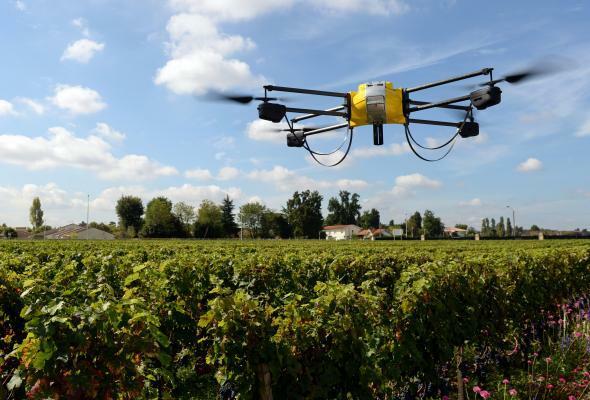 A drone monitors vineyards in Pessac, France. If anybody thinks about this issue at all, it’s pretty clear that it’s a problem worth careful consideration. The trouble is the people who are in a full-court press to expand the use of unmanned aircraft systems really don’t think they should have to worry about the safety of existing users of airspace. Taken to the extreme, they feel it’s up to other airplanes to stay out of their way, not vice versa. Here’s the problem. The fundamental basis of separating aircraft in our skies is visual—the so-called “see and avoid” concept loosely described in Title 14 of the Code of Federal Regulations. There’s nobody aboard a drone to do the seeing, so they can’t legally operate without an FAA Certificate of Waiver or Authorization, or COA, or similar specific permission by exception. First, drone operators don’t want to fly from airport to airport. They want to fly low and do stuff with their unmanned aircraft—that means visual flight rules operation, where see-and-avoid is the only game in town for separating aircraft from one another. Second, many unmanned aircraft are too small or fly too low to be readily detected by radar, especially since nobody wants to have to install a transponder—which would improve its detectability—because doing so adds weight and uses electricity. Third, instrument flight rule operations don’t give anyone a free pass from see-and-avoid anyway. The rules are clear that if you’re in visual meteorological conditions, you’re responsible for seeing and avoiding other aircraft regardless of what kind of flight plan you’re on. True multispectral detect and avoid systems capable of seeing both aircraft emitting identification signals as well as those that aren’t will be big, heavy power hogs impractical to install on the vast majority of drones, which will simply insist on being excused from the requirements because “they’re small”. A detect and avoid system that can’t keep the aircraft clear of other aircraft, terrain, and other obstacles when its pilot is out of the loop (through a failure of the control link) is essentially useless under the same conditions when it might be needed the most—wending its way home to a “lost link” location amid other traffic. Used together, operational segregation of drones and the use of COAs have kept the skies safe for a long time now. COAs typically include provisions specifying exactly how the lack of an on-board pilot for see-and-avoid purposes is to be compensated for, usually by requiring the pilot in command to keep the aircraft in visual line of sight at all times and by having a separate “visual observer” to help keep watch for other (manned) aircraft that might get too close. They also require drone operators to file a “notice to airmen” in advance of their activity to help other pilots know where extra vigilance on their part may be needed. Remember, too, that see-and-avoid as a concept anticipates a two-way street: two pilots watching out for each other. An unmanned aircraft too small to be seen by another pilot is perfectly capable of bringing down a manned aircraft if not seen in time to avoid a collision. If and when such an unhappy event takes place, only one person had any skin in the game, and it isn’t the guy on the ground with the remote control box. I worry about these things … a lot. Unmanned aircraft represent terrific technology applications but also pose real risks to any manned aircraft in their vicinity. Such risks grow significantly when the drone is somewhere unexpected, doing a job typically done by manned aircraft (meaning it could be in the exact same environment), or flown in complete disregard of the possibility that anyone else might be wanting to use “their” sky. Analogous risks associated with the use of a public resource arose a century ago when amateur radio became a hobby with the potential to adversely affect the public’s use of finite radio frequency “spectrum.” The American Radio Relay League and other national bodies like it worked with regulators to ensure licensing of ham radio operators and their use of only specific frequencies where they’d stay out of the way of other users. That strategy has worked well ever since, with ARRL now the main source of volunteer licensing examiners in the U.S. Contrast this with the openly adversarial approach taken by model aircraft enthusiasts, who assert that their hobby is perfectly safe when conducted in accordance with their rules (which of course aren’t binding on anyone) while lobbying hard to make sure the FAA can’t oversee any aspect of model aircraft flying. All that’s done is pump up the market for models flown for purposes light-years away from hobby and recreational use and is rapidly creating a truly hazardous environment in many locations that the modelers simply ignore. When a model aircraft is indistinguishable from an unmanned aircraft used to carry out some kind of commercial activity, and it’s a hassle to abide by the rules governing the latter, well, I guess everything will become a model aircraft … right? Commercial Aircraft: How can you distinguish commercial airliners in the sky? Unmanned Aerial Vehicles: How, if at all, will cargo airlines become pilotless? Helicopters: Why are helicopters, this long after their invention, still a luxury for the rich?